1889. The Paris World Fair is the latest place to be, and the masses marvel at the latest technical achievements which are on exhibit there. Meanwhile, the big industrial trusts, supported by their governments, are planning their next step - the conquest of Mars and the mining of the fantastic ores found in its subsoil. In Mission: RED PLANET, you control one of these big corporations. You try to recruit the best scientists and astronauts, and launch rockets both to explore the planet and to take control of the most promising places before anyone else arrives. Spies and armed forces are also required since this unexplored world is full of secrets and dangers and, many thousands of kilometers away from the nearest journalists, socialists and other such troublemakers, competition is no-holds-barred. 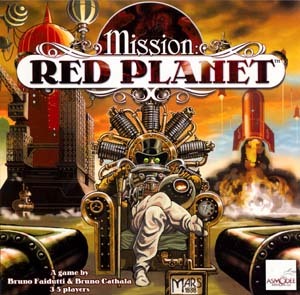 Mission: RED PLANET is a majority control game, a character selection game, and an exploration game, with a balanced mix of bluffing and strategy. In order to charter shuttles to Mars, and take control of the regions where the most interesting minerals will be found, you'll have to make the best use of your nine characters' powers. The scientist can make mysterious discoveries, the saboteur can blow a rocket up before it leaves the launch pad, the pilot can change a shuttle's destination, and so on.